Anyone who lives along the central California coast will tell you that summer brings a marine layer a mile thick and five months long. Which is a shame, because the fog and haze effectively stop all coastal photography for the entire summer. So it was not without excitement that I watched a few clouds building up this evening in October. 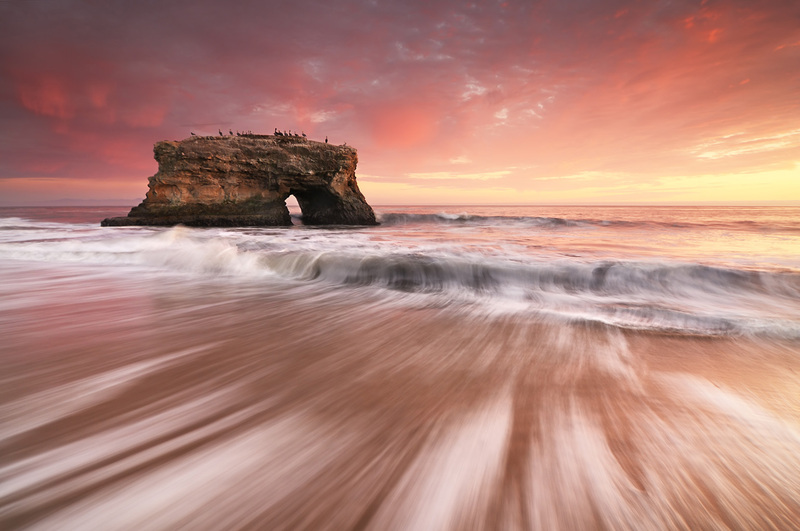 In hopes of witnessing some sunset color, I met a few fellow photographers at Natural Bridges State Beach where we quickly realized that this was going to be no ordinary light show. As the sun set, the color arrived in heavenly waves: orange, pink, and purple light glowing so intensely it seemed to emanate from the very air, rock, and water. View more beautiful California coastal photos.